A worldwide explosion of mobility versus bodiless interaction in digital networks; hypermobility of flows of capital and goods versus the immobility of the biological body; the pressure of ecological and energetic depletion versus the desire for total freedom of movement: our present-day mobility regimes are characterized by deeply rooted contradictions. Media critic Eric Kluitenberg seeks a perspective for intervention to achieve ecological and social stability. 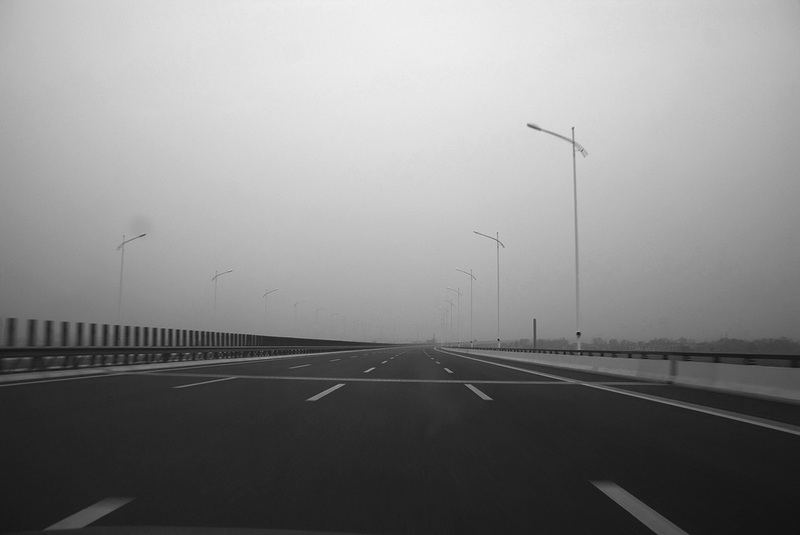 Empty motorway near Xi’an, Daan Roggeveen, project Go West: The Changing Face of China's Invisible Cities, 2010. 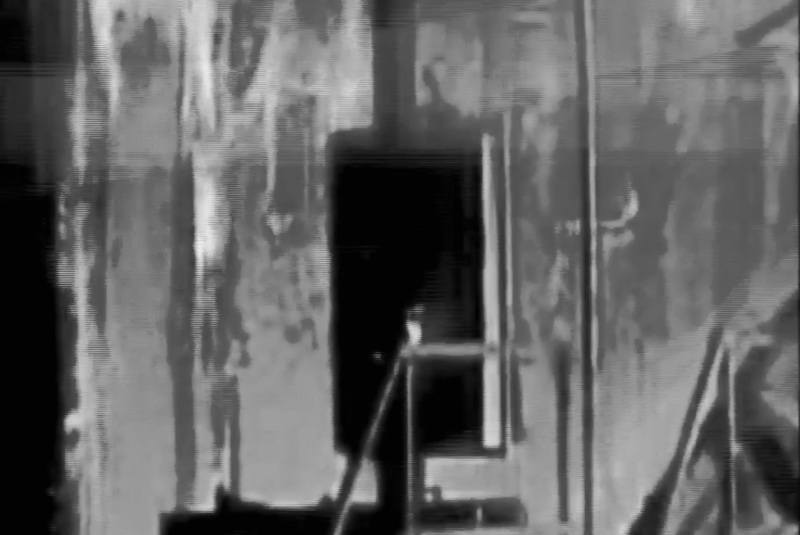 Burning cell, K wing, Schiphol-East Detention Center, 27 October 2005, still from the campaign video Free Ahmed Isa. It is exactly eleven o’clock in the morning, 18 March 2010. We are speaking with architect Daan Roggeveen through a rather poor Skype connection. Right now he is in the departure hall of Xi’an International Airport, waiting for his flight to Shanghai. He has just enough time to give a presentation on Go West, a research project that he and journalist Michiel Hulshof are currently undertaking in Central and West China.1 The topic is the explosion of mobility in the new metropolises that China is stamping out of the ground with astounding speed. The setting for this curious talk is the opening programme of the ElectroSmog Festival for Sustainable Immobility.2 The idea of the Festival is to investigate new forms of connectivity through digital networks as alternatives for physical travel. In the auditorium of De Balie in Amsterdam, and through live streams of the Festival on the Internet, Roggeveen’s story is supported by a slideshow of empty highways, ghostly new urban landscapes and desolate shopping centres. Wuhan, the most recent object of Hulshof and Roggeveen’s research, is a medium-sized city in central China. We ask how many cars are added to the flow of traffic there each day. The estimate is approximately 500. As we speak, over 30 cities of comparable size (between one and three million inhabitants) are being constructed in China, not counting the areas of the larger urban agglomerations (Beijing, Shanghai, Shenzhen / Hong Kong / Guangzhou). A quick calculation tells us that a cautious estimate would have to reckon on 15,000 new cars per day. And then we receive comparable reports from Delhi, Dhaka and Nairobi through video chats with Internet activists, designers, filmmakers – a dizzying panorama of out-of-control hypermobility throughout the entire world. After this, the departure point of the Festival, a search for sustainable immobility, seems almost laughable. After all, we haven’t even begun to talk about the explosion of air traffic, which shows a comparable exponential growth. This headlong rush towards a worldwide traffic jam can also be taken, however, as a convincing call to seriously look for viable alternatives for the persistent compulsion for motorized transportation. Owing to the new developments in information and communication technologies and the transference of physical production to low-wage countries, the Western economies, including the Netherlands, have been transformed into primarily service and logistics oriented economies. This has given rise to new regimes of mobility, but also of immobility. Nowadays, increasingly complex flows of transportation are being coordinated by equally complex flows of data in order to achieve optimal, just-in-time efficiency. An ever-finer-meshed tracing net is being flung over the physical space in which rfid-tagged objects move as nodes in a ‘network of things’. In the meantime, workers are increasingly becoming glued to their computer screens as the complexity of the logistic operations grows. The informationalization of society and the economy leads to the rise of counterforces, however.3 Dematerialized labour, production and distribution create the desire for physical connectivity and interaction. Body culture, nightlife and tourism are recognizable expressions of this. They also are the most common socially-accepted forms of satisfying that desire. The great promise of the information age was that with the increasing possibilities of information and communication technology, the necessity and desire for physical contact – and accordingly mobility – could be drastically reduced, and thus ecological sustainability strengthened. Considering the above, this promise must be called into serious question. Among other things during the ElectroSmog Festival, the ideas of the American futurologist Alvin Toffler were critically revaluated. In his adulated book The Third Wave, on ‘the coming information age’ written at the beginning of the 1980s, Toffler developed a vision that has become reality only in part.4 One of Toffler’s most attractive notions was the rise of a new type of living and work environment called ‘the electronic cottage’, a fusion of living and working made possible by advanced communication networks and an economy primarily oriented to information processing capacities. According to him, it was patently obvious that that the home / teleworker in the electronic cottage would have a mobility-reducing effect. For Toffler, another aspect was at least equally important: the saving of time. What with travelling to and from work having become unnecessary, time could be freed up for private life. This would lead to a revitalization of the oikos (family, the home) and, in a broader sense, to a revitalization of (local) community life. The history of teleworking shows the opposite, however. Even after more than 30 years of research, endless series of pilot projects and massive investments, such a revitalization still has not got off the ground. The refinement of information technology, the rise of a new (under) class of information workers, and in particular the mobilization of high-quality information technology (laptops, WiFi, third and fourth generation wireless communications networks, smartphones, tablets and other handhelds) have not led to relief in the private sphere or to a revitalization of family and community life. The oikos has fallen hostage to the continual obligation to produce and the abolition of the separation between work and private life. And nowadays, the most advanced corporate practices are dominated by the 24-hour economy and just-in-time production and distribution methods. Mobility researchers have ascertained that in zones where the density of communication is greatest, mechanized mobility actually demonstrates the highest intensity.5 Moreover, in the real-time economy, the shutting off of the ubiquitous flow of information is a strategic risk over which the lower echelons in the hierarchy of information workers have no say whatsoever.6 Exit or sabotage are in principle the only possibilities they have to choose from. The concept of polar inertia can be described an accelerated modernity where everything happens at the speed of light without the need to go anywhere. As Paul Virilio, the philosopher of speed, so beautifully put it, the biological body itself is increasingly in a state of polar inertia in the midst of swirling data flows. As the flows of information are accelerated to immediacy, the point where the time it takes to transfer information is no longer perceptible, the body is forced into a state of total immobility. People who work at call centres will immediately recognize this experience. Architect Wim Nijenhuis even speaks of a ‘compulsion to remain seated’, which leads to countless physical aberrations, rsi, muscle deterioration, pain in the joints, bulging physical contours, or even hair loss caused by electronic screens lacking adequate protection from radiation! The emerging regimes of mobility and immobility are characterized by extreme internal contradictions. The causes are so complex that attempts to put them into an unequivocal and linear perspective are doomed to fail from the start. At the same time, there is a great ecological and social pressure to find solutions for the disruptive forces released by these emerging regimes of mobility and immobility. What considerably complicates their analysis is the fact that they cannot be treated separately from the sweeping transformation to a global economy in a network society. In financial markets, for example, we have the picture of an almost completely autonomously functioning hypermobile system. At the same time, the opposite has proven true in the area of migration. Borders are opened only selectively, on the basis of specific socioeconomic criteria, but are increasingly closed to a majority of the world’s population. The changing border regimes are producing new forms of mobility and immobility that have far-reaching ethical and political implications. The causes and effects of the above are the subject of intense social debate and scientific research, and motivation for countless international activist movements. Out of the boundless desire for complete freedom of movement (‘sovereign mobility’) rise the contours of what Georges Bataille describes as a ‘general economy’ of im / mobility.7 According to him, man is not a rationally thinking being. He is sooner led by abundance rather than wishing to let himself be limited by the force of economic circumstances. Such an ethic principle contrasts sharply with the political reality of the emerging regimes of mobility and immobility. Moreover, this political reality is at odds with the pursuit of ecological stability. A thorough analysis of both the emerging global political constellations and the desire for sovereign mobility is therefore necessary in order to avoid a crash and escape global gridlock. In such an autonomously functioning system of networks that give real-time access (without any loss of time) to all relevant financial data, the location from which these activities are developed no longer seems to play a role. However, as Sassen points out, the structure of this financial system is much more emphatically differentiated than the above picture would suggest. First of all, the increasing complexity of the instruments and the technological knowledge that is necessary in order to let these markets function are of such a nature that they raise the need for what Sassen calls ‘cultures of interpretation’. This expertise is not available to the same degree everywhere, so that the financial centres where it is abundantly at hand become more important. The academic embeddedness of the financial system also has its limitations. It does not give a completely adequate picture of the dynamics of derivatives trading, which is also partly influenced by local factors. What’s more, it is not always possible to unequivocally determine the accuracy of risk assessment models and the effectiveness of individual firms.11 Blindly trusting in software instruments is thus not wise. Financial centres where academic institutions, businesses, financiers, technological firms, local authorities (supervisors) and technological infrastructures form nested communities are therefore becoming increasingly important. Only together, and in mutual interweaving, do they have the possibility of operating effectively in this new global financial system. The fact that the financial centres do not function autonomously is also shown by the guiding principle of derivative trading: the individual risks connected with investing in specific companies and projects are shared by multiple players in the market. Moreover, these are also shared between different territories and economic zones within the global financial network. Business risks are thus absorbed in the system as ‘market risks’. Because of this, the market as a whole is considered better capable of covering local risks and absorbing eventual disappointing results. The problem that arises here, as the recent financial crisis has shown, is that if all of these local risks become too great when taken together, the hypermobility and interwovenness of transnational capital flows is precisely what can threaten the functioning, even the continued existence, of the financial system as a whole. Likewise, the increased importance of local financial centres such as Wall Street, City of London, Tokyo and Frankfurt a / M that operate in a global financial market paves the way to the creation of hypermonopolies or oligopoly. If they are too strongly affected by risky derivatives, they can suddenly tumble and set off a cataclysmic downward spiral in markets across the globe (in real-time). This happened, for example, in 2008, after the failure of Lehman Brothers Holdings Inc. While the global financial system seems to have become borderless, it thus by no means has become placeless. Paradoxically enough, the very same authority that traditionally is responsible for policing the borders and the machinery of the state is now playing a crucial role in the functioning of this global system – as supervisor and risk manager. Although this kind of cross-border, horizontal network connection is generally less formalized than the hierarchical organizational structures of the wto type – the traditional target of anti-globalization protesters – this does not mean that these horizontal ties are only reserved for informal civilian and activist initiatives. Nor do they play a marginal role in the new transnational politics and economic constellations of the globalized world. Influential actors such as multinational enterprises, international lobby groups, ngos and transnational institutionalized political movements can also avail themselves of these ties and accordingly bypass traditional hierarchical (control) structures. The mix of digital networks, platforms and transactions with their own social logics guides the use of new technologies. According to Sassen, this signals the existence of complex assemblages that form specific spatiotemporal orders, each with their own capacities, possibilities and vulnerabilities. These are hybrid constellations of local, territorially-bound elements and networked, placeless electronic connections. They form the basis for the emerging regimes of mobility and immobility in (transnational) physical and social exchange. Contrary to what is often assumed, with the advent of the new global constellations – or assemblages, as Sassen calls them – the nation-state and its borders are by no means disappearing. On the contrary, they are undergoing a fundamental transformation. Of note in this regard is that Sassen characterizes institutions like the imf and the wto as temporary indicators of that transformation, not as the embodiment thereof, as alter-globalists and protest actions around summit meetings generally suggest. According to her, the nation-state actually plays a crucial role in this transformative process and in the functioning of the new political and territorial assemblages that are arising from it. Guaranteeing the sovereignty of the national territory and guarding the border was always the privilege of the nation-state; it is also the privilege of the state to give it up. Countries are opening their doors for foreign investment and flows of capital, and governments are developing specific visa regimes for knowledge workers, or conversely, for unskilled and low-paid work. They are also making agreements with other governments for the transference of the production of goods and services to low-wage countries. Through this selective opening of the border, new forms of mobility and immobility are emerging with respect to knowledge, capital and labour. Digital networks are making such selective openings possible and operational, and creating new spatial orders, such as the special economic zones in China, as well as new temporal orders, such as temporary work and residence permits and differentiated visa regimes. The exclusive right to a territory for a homogenized population (language, culture, ethnicity), the classical project of the nineteenth-century nation-state, is being relinquished in favour of a more differentiated social, economic and technological profile. Privileges such as the right of establishment and / or residence, access to knowledge, infrastructure and services are granted to certain actors (often multinational enterprises that want to open new branches), or to certain social groups (knowledge workers), while these are denied to other groups, such as migrants and civilians who do not fit the desired profile. The border, once considered the geographical demarcation of a territory, and the means by which the state asserted exclusive authority over its physical domain, is folding inward, as it were, and transforming into a filter that only gives certain groups access to civil privileges and rights. The emerging border regimes operate both inside and outside the nation-state and its territory, and are dependent on the application of networked data profiles and an omnipresent surveillance infrastructure. Consequently, every person, as a professional, citizen or migrant, can be granted or denied access to specific rights and privileges, and also to territories that no longer are only nationally determined, but can assume any desired form or scale, from local to global. With the help of new tracing technologies such as rfid and biometric scanning, freedom of movement is determined by the representation (the profile) of the biological body in the database. At the same time, however, the possibility also arises for individual citizens to free themselves of ‘state capture’ by making use of the new ‘denationalized’ rights and privileges. Through the coupling of data files, such as in the Netherlands’ euphemistically named ‘citizen service number’ (bsn), the ‘data body’ functions as a filter for the state-sanctioned national social and economic traffic. At the same time, it operates supranationally, on account of the new database systems that have been set up for the purpose of controlling international passenger traffic, such as the ‘Schengen Information System’ developed for the European Schengen Area. The privilege of freedom of movement from place to place within this area is granted to citizens of the Schengen countries and holders of a valid visa, while the same databases that sanction this privilege are used to prevent undesirable ‘aliens’ from crossing the outer border or track them down within the territory of the Schengen Area. A returning question in regard to the emerging regimes of mobility and immobility is whether mobility should be considered a right or a privilege, by which the ecological perspective collides with the ethical principle of freedom of movement. Attempts to change the direction of the growth curve of hypermobility in advanced and developing economies have met with virtually no success. And influencing behaviour by enhancing ecological (self) awareness also offers no effective counterbalance to people’s desire to move around freely and travel without restriction. Various practical interventions to achieve a more even distribution of mobility have by no means proven capable of curbing this exponential growth. Only one mechanism seems capable of activating an immediate attitude of behavioural correction: the imminent scarcity of (energy) sources. Once their price threatens to grow too high and the ecological limits become apparent, the logic of the market unrelentingly sets in and forces a change of behaviour for economic reasons. Unfortunately, human behaviour has proved to be anything but rationally determined. The strongest criticism of the utilitarian logic of rational economic theory, which is based on the division of scarce means for the benefit of maximum satisfaction of demand, is formulated by the French philosopher and writer Georges Bataille in his essay on ‘general economy’.16 In the first part of that essay, Bataille contrasts his notion of a ‘general economy’ with what he terms the ‘classical economy’. Bataille brilliantly substitutes ‘sovereignty’ for the utilitarian logic directed at efficiency, and ‘abundance’ for (the economy of) scarcity. He makes short work of the utilitarian principle. An activity with practical usefulness always derives its significance from what it is useful for, after all, not from the activity itself. To a large extent, therefore, that activity is also intrinsically meaningless or valueless. Bataille observes that, on the contrary, in natural processes the most crucial activities, such as reproduction, are characterized by an excessive expenditure of energy. Not efficiency but abundance is the guiding principle here, not production but (boundless) consumption. ‘Life beyond utility is the domain of sovereignty,’ according to Bataille. Only by ridding our activities of the yoke of that utility is it possible to come in contact with what really – intrinsically – is of ‘sovereign’ importance for us. The technical philosopher Lewis Mumford also observes that human beings, with their excessively developed brains, always have an extreme surplus of (mental) energy that must be ‘displaced’ in one way or another.17 Rational criteria play only an extremely limited role in the expending of this abundant (life) energy. Suppression of these essentially libidinal forces inevitably turns against the social order and can even eclipse the urge for self preservation. The freedom of movement (the right to unlimited mobility) is a constituting element of this ‘sovereignty’ in the Bataillian sense. ‘Sovereign mobility’ is a cherished achievement of the affluent and the self-emancipating sectors of the global society. It is soon considered an acquired right and not a privilege that simply could be given up in the face of material limitations. The sovereign body wants to be able to move freely, and the cost of that mobility will ultimately hardly form an effective restriction in curbing the boundless desire to move freely from place to place. The boundlessness of this desire also explains why the character of the human relation with the automobile is much more libidinal and excessive than utilitarian and rational. In the search for a responsible development of mobility, the balance between ethics, sovereignty and sustainability is extremely precarious. The desire for sovereign mobility and the necessity of attaining ecological and energetic stability are advancing straight towards a head-on collision. Such a crash scenario has incalculable consequences for the ecology, the economy and society. However, we should not resign ourselves to doom scenarios, which are based on the impossibility of taking action in the emerging global constellations. Doing nothing, not intervening, is not an option, nor do attempts to deny the desire for sovereign mobility lead to solutions. The internal contradictions in the emerging regimes of mobility and immobility elicit tensions that ultimately will turn against them. Possibilities for intervention present themselves precisely where the contradictions become manifest. These are the collision points where local realities and global dynamics collide, where people are confronted with the fact that they are excluded from the privileges of sovereign transnational hypermobility. More than anything, the nature of these intervention possibilities is local. The complexity, intransparency and ungovernable quality of the emerging global assemblages of territory, authority and rights that Sassen analyses reinforces the importance of the local as an anchorage point both for transnational organizations and local civic movements. The immediate effects of the emerging global regimes manifest themselves at the local level: guarding of the border, migration, registration, surveillance and identity checks, the flows of capital, energy, goods and people (or their absence). This intensified role of the local is further strengthened by the growing importance of organization at the city level compared to that at the national level. This is the preeminent place where the forces that produce and guide the emerging global consolations converge. In this new urban context of intense and digital global connectivity, it is possible for local initiatives, municipal and regional governments, citizens’ initiatives, activist groups, ngos and other non-state actors to connect up with similar initiatives at other locations. They can share methods, knowledge and experience with each other, coordinate actions, or collectively exert pressure on national and transnational institutions. The particular strength of horizontally organized network connections is that these local actors have direct access to one another and to each other’s knowledge, methods and local capacities. Whereas in former times, international influence could only be exerted through national authorities, nowadays traditional hierarchical constructions of authority are being bypassed. Out of what Sassen calls the deliberate multiplication of local practices – the multiscalar nature of the local – global consolations can arise that generate an effective counterforce for combating undesirable effects of globalization. The local level is the logical starting point for a nonlinear search for a balance between the desire for sovereign mobility and the necessity for ecological and social stability. The detention camps for undesirable aliens are built locally and deportation centres burn in the local memory. Traffic clogs the streets in front of our doors, but our own cars are often parked there too, while above us in the polluted atmosphere the deafening roar of the air transport continues unabated. The emerging regimes of mobility and immobility take root in the local, and they can be addressed in the multiplicity of languages and dialects spoken there. The crash scenario cannot be ruled out just like that, however. The alarming picture that emerged from the opening discussion of the ElectroSmog Festival, of a planet hurtling at breakneck speed towards global gridlock, permits no resignation. The crash of the present system of hypermobility can as yet end in a fatal worldwide standstill. 2. For documentation on the festival, see: www.electrosmogfestival.net. 3. ‘Informationalization’ refers to the dominance of information processing systems in society and the economy, of which ‘computerization’ is only one part. See: Manuel Castells, The Rise of the Network Society (Malden, Massachusetts: Blackwell Publishers, 1996). 4. Alvin Toffler, The Third Wave (New York: Bantam Books, 1980). 5. For further elaboration of this idea, see among other things my essay ‘Distance versus Desire’ in the ElectroSmog Festival blog: www.electrosmogfestival.net. 6. For an introduction to this concept, consult the survey by The Economist, www.economist.com. 7. I borrowed the concept of ‘general economy’ from: Georges Bataille, The Accursed Share: An Essay on General Economy, Volume I, Consumption (originally, La Part Maudite [Paris: Les Éditions de Minuit, 1967]; here: New York: Zone Books, 1991). 8. Saskia Sassen, Territory, Authority, Rights: From Medieval to Global Assemblages (Princeton, New Jersey: Princeton University Press, 2006). 16. See: Georges Bataille, La Part Maudite (Paris: Les Éditions de Minuit, 1967). 17. See: Lewis Mumford, The Myth of the Machine: Technics and Human Development (New York: Harcourt Brace Jovanovich Inc., 1966), 14–47.